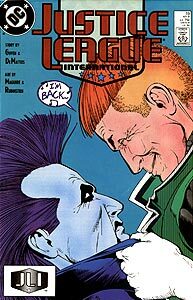 Cover Description: A cheerful Guy Gardner towers over a snarling Lobo. (No Booster Gold.) The cover depicts the same characters as the previous issue, but switches the dominant position of each. Brief Synopsis: Lobo fights then joins Justice League during a recruiting drive on Earth. Booster stops the spontaneous fight between Lobo and Guy Gardner by trapping Gardner in a force field bubble. Apparently, the emerald energy of Gardner's ring is unable to penetrate the force field. Fortunately for Gardner, since Booster intends to keep him encased until the enraged Green Lantern calms down, which will take at least several pages, Booster's force field is not impervious to oxygen. BUSTER GOLD: Still trapped in Booster's force field, Gardner calls Booster "Buster." That's not the right way to get out of that bubble, Guy. Via a telephone call with Oberon, Black Canary II withdraws from the Justice League. Despite his reservations, Booster joins Beetle in a membership drive for the Justice League at the request of Maxwell Lord, who is finally well enough to return to the League after being shot in Justice League International #9. Beetle and Booster stop in at the apartment of Wally West, the Flash, in order to recruit him for the Justice League International. The Flash's alter ego was not a secret, as West had revealed his identity to the world. Booster is surprised that the Flash is not financially wealthy, showcasing Booster's inability to grasp the benefits of altruism. Two people who appear to be husband and wife team Carter and Sharon Hall, a.k.a. Hawkman and Hawkwoman, agree to re-join the Justice League at Batman's request. Both were members of the Justice League of America during the 1970s. Hawkwoman calls Hawkman "Carter." In future years, it will be discovered that they were actually impostors Fel Andar and Sharon Parker masquerading as Carter and Sharon Hall in order to infiltrate the League. Following the recruiting drive, the new lineup of the Justice League International is revealed on Oberon's computer monitor. The league has added previous members Hawkman, Hawkwoman, and new member Lobo to the active roster. (As a provisional member, Lobo will have to prove himself before being granted full membership in the League. Since he is only biding his time until he can fulfill the Cluster's contract on the lives of Big Barda, Martian Manhunter, Rocket Red #4, and G'Nort, it is unlikely that he will make it past the grace period.) Green Flame and Ice Maiden officially change their codenames to Fire and Ice. Boosterrific Review: The talents of artist Kevin Maguire are showcased in this issue featuring a membership drive for a weakened Justice League. Maguire skillfully renders explosive action and subtle emotion alike with a deft hand and careful attention to detail. With art this good, the writers could probably take a month off. Fortunately they instead chose to pack this issue with humor and emotion largely based on the individual characterizations they have been so skillfully carefully crafting since the series' launch. If there is any fault with this book, is it the fact that the issue is essentially a series of two-page jokes that fail to combine into a single, unifying story. That is a minor quibble, however, in what is otherwise an ideal comic book for fans of great art, humor, or characterization. Very fun issue and Booster and Beetle as recruiters is priceless.